Glenn C. Gerhard (1930-1995) began producing Standard gauge trains for sale in the late 1970's. He built these trains in his basement through 1987 when he sold the company to the M. G. Carter Foundry in Coxsackie, New York. Glenn made many, many different types of freight cars along with a diesel and steam locomotive. All Glenn Toy Trains were constructed of cast or sheet aluminum, and were quite heavy. Glenn Gerhard made his trains in fairly small numbers. Glenn Toy trains also made the first commercially available 72" wide-radius Standard gauge switch tracks in the late 1970's. Glenn teamed up with fellow collector Red Forney for a short while and they produced a few different cars together. Forney would make the sheet metal bodies and add the Glenn Toy Trains cast trucks and other detail parts to them. Red eventually ventured out to make his own line of Standard gauge trains. Over the years, Gerhard was featured in several model railroad magazines for his model railroad workmanship and design. Glenn Gerhards' interest in trains started when his father got him a 'Baby State Set' from the nearby Lionel factory at Irvington, NJ when Glenn was three years old. Later, Glenn salvaged a Lionel #10E locomotive and a flat car from a neighbor's fire in the Woodbridge, NJ neighborhood where he grew up. His dad cut a yardstick to make the flat car into a gondola with wooden sides and ends, just like the first car Joshua Lionel Cowen produced in 1901. Glenn chose the 'Lionel Handbook for Model Builders' as his Christmas present in 1941 and a #512 gondola in 1942. After the war he got a green Lionel #517 caboose at Macy's. Glenn was too ill to attend school at ages 13-14, and spent time making his own rolling stock. As a Boy Scout project, he made a Pennsylvania Railroad X29 box car out of wood, with balsa doors and a button for the brake wheel. He also built a boxcar from a wooden cheese box, a 65-foot mill gondola of cardboard, and an H0 Atlantic steam locomotive of wood and cardboard on a hand-filed brass frame, with a Mantua motor, drivers, and gears. Such a boyhood might have led Glenn Gerhard to go to work for a railroad, but history and life are not that logical. Instead of riding the rails after graduation from Woodbridge High School in 1949, he became an over-the-road owner/operator truck driver, hauling goods over interstate highways as a lifetime career. He contracted with several companies across the United States to haul with his trucks. Gerhard eventually retired from trucking to begin full time what had been his lifelong passion of model railroading. Instead of using presses to punch out sheet metal parts like most of the other manufacturers of Standard gauge trains did, Glenn Gerhard worked with a foundry to make almost all his parts. The frames, bodies, trucks, wheels, and detail parts were all cast in aluminum. These trains are well constructed and equally well detailed. The freight cars are big, and heavy. Around thirty different styles of cars where produced through the years. Many hobbyists believe that Glenn Toy Trains produced the most impressive and detailed line of Standard gauge freight cars ever made. The freight cars were available in many different configurations including boxcars, reefers, stock cars, tankers, hoppers, gondolas, flats with many different loads and even a bay window caboose. Some of Glenn's other cars were not the modeler's norm, but still very prototypical like a chlorine tank car, pickle car, watermelon car and a log car. What made Glenn Toy Trains different was the cast aluminum construction. The prime motive power movers of Glenn Toy trains were Alco F1A and B units. The Alco F1A unit featured two motors, driving all eight wheels by worm gears and belts. More A and B units could be added to create a longer train. Glenn sold about 300 diesel units at $350 each. Only one loco was ever returned to him for repair under Glenn's policy of 'perpetual care.' It needed a replacement for the original nylon worm gear, because the power trucks had never been lubricated. A Pennsylvania man is said to have pulled a string of 5O Lionel hoppers with a Glenn A-B-A unit. A consist of 15 Glenn hoppers would be remarkable, as they weigh more than three pounds each. In his last price list, Glenn said he would alter the Alco A or B units for 'O', 1 or G gauge at $400 each. His successors abandoned the diesel units and did not offer any locomotive with their Glenn cars in G gauge. Glenn Toy's ultimate product was a USRA 0-6-0 steam switcher. The Glenn Gerhard standard gauge #9203 Pennsylvania 0-6-0 steam locomotive and tender was constructed mainly of block aluminum with some steel and brass parts. The switcher was equipped with an open frame motor that drove the rear axle via a worm gear. The worm gear is geared pretty low, so it makes a lot of noise and does not go very fast or will not pull a large load of the heavy cast aluminum Glenn freight cars. There were no connecting gears to drive the loco's other 2 axles. They were powered from the rear wheels via the side rods. The majority of locos were made with flanges on all six drive wheels, so it does not navigate 42" curves very well. Glenn built about 70 USRA 0-6-0 switch engines just before he sold the business. These steam engines may have been the project that drove Gerhard to sell, as it was an ambitious project for a one-man shop to undertake. Glenn had to pay someone else to finish the patterns, although he usually did all the technical work himself. He was out of pocket $24,000 before the first steam engine was finally shipped. He tried to finance the project by discounting the price for advance orders. Some buyers paid as little as $500 for an engine. Even at the list price of $900, they were sold below actual cost. Tenders for the 0-6-0 came in two versions, one for coal and the other for fuel oil. Glenn also made about ten very small diesel switch engines, using stamped steel bodies fabricated by Red Forney, which ride on a single Glenn power truck. A heavy Lionel locomotive, such as the 400E or 408E, could pull a string of Glenn cars. Even better would be one of the huge GG-I's in Standard gauge which Bob Hendrich built. Glenn freight cars were designed and constructed in several variations. Glenn Gerhard used two lengths of frames, the 14 inch 100's and the 16 inch 200's. Lionel did the same in Standard gauge, but its longest car is shorter than any Glenn Toy. Lionel used a flat stamped steel frame for every car in its #100, #200, and #500 series, except the hoppers. Glenn cast special frames for his caboose, tankers, and hoppers. One log car has a unique I-shaped frame of its own. The undersides of Glenn's #100 series frames are alike. From end to end the long frame member has six pairs of lateral braces, including those where the kingpins for the trucks are set. The casting also includes an air tank reservoir, the brake cylinder, and the box for the air brake valves. The longer #200 series frames have the same air brake tanks, two more pairs of braces, and sometimes a larger fish belly center frame member. As floors inside the boxcars, all the frames are smooth on top. For the flat cars, the top sides are scribed like wooden planks or crosshatched as steel floors. Car roofs and catwalks were made from 1/16 inch aluminum sheets or plates. The wooden sides of some cars are 1/32 inch aluminum plates with the boards scribed in the metal. Glenn was justly proud of his spring loaded, self-equalizing trucks and latch couplers. The trucks have cast bolsters (larger than Dorfan's), each of which is held to the crosspiece by a pin and spring. The axles and wheels can move up and down or sideways if the track is uneven. Because of these springs and the weight of the cars, Glenn trucks do not jump the track as the flex trucks of Lionel, American Flyer, and McCoy sometimes do. Gondolas and hoppers seem to have been both the first and last cars that Glenn supplied. About 1977, Glenn and Red Forney made 150-200 gondolas, boxcars, and cabooses together. Forney made the hopper bodies of stamped steel. He learned that method during an apprenticeship in the McCoy shops at Kent, WA. Glenn supplied the trucks and detailed the cars, adding ladders and handrails. Glenn never built the five different gondolas on his last 1985 price list. He built only the long mill gondola with ends that open. No doubt the best Standard gauge postwar hopper made was this Glenn Toys version. It was not made of tinplate, like those produced by McCoy, Classic Model Trains, Red Forney or Roberts' Lines, but cast aluminum with as much correct detail as the finest G gauge plastic models. Glenn Gerhard made a limited number of hoppers before he sold the company in 1987. The new owners offered a few Glenn Toy bodies on G gauge trucks, under the name TJ Classic Trains, but not the same hopper that Gerhard produced. TJ Classic Trains' product was a gondola in G gauge made by adding high sides to the bulkheads of a Glenn flat car. Glenn would cast three hopper bays together, so they could be used in either sets of two, three, or four under the hopper cars or gondolas. To make a 2-bay hopper, one hopper bay was cut off from the 3-bay casting to outfit a hopper car with two bottoms. Red Forney also made steel hoppers. Bob Hendrich says that a few Forney hopper bodies were lengthened to use the Glenn three bay casting. Glenn preferred to cast his own hopper bodies, with an open frame for his hopper bays and doors that actually work. Each door is held shut by two small hooks at the ends. You simply unhook the door to open it, and then hook it closed when empty. Fewer than a hundred of these hoppers were made. Four variations of the Glenn Toy Trains flat car were made and sold in quantity, besides the extra long piggy-back for LCL boxes that was one of a kind. The basic flat car is 14 inches long. It has a brake wheel at one end and pockets for ten posts along each side. A similar car has posts cast along its straight sides and ends, for fitting brass rails like those found on the Lionel Standard gauge floodlight cars. It carries ten tanks of liquid chlorine, lying on their sides in a fluted rack. A casual observer may mistake these tanks for flashlight batteries. The basic flat car comes with bulkheads at both ends, to safeguard a long load of timber or pipe. With a partition down the middle, between the bulkheads, this car is meant to carry short lengths of pulpwood across its width. In 1980 Glenn Gerhard displayed a new Standard gauge tank car at the April York Fairgrounds meet. The major components were cast aluminum, except the tank tube which was aluminum tubing. The trucks, also casted, were spring loaded self-equalizing and contained bronze oil impregnated bearings. The couplers were reproduction latch couplers which were spring mounted for height variations. 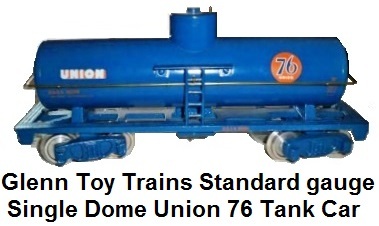 The first Glenn tank cars have one, two or three domes. They were decaled to carry oil, chemicals, or food products. With four domes the tanker became a wine car. The rare H.J. Heinz pickle car looks like a gondola with hatch covers. Glenn called it a tank car with rectangular vats. He also listed a cylindrical type Heinz vinegar tank car and tub type pickle cars for two smaller companies. The latter would be similar to the plastic G gauge car made for the 1990 TCA Convention held in Atlanta. Glenn planned to put four tubs on each car but sold the business before he made any of them. Two extra long Glenn tank cars were custom made by Wayne Henk, with a prototype platform around their single domes. Box cars and refrigerator cars came in both the 14 inch and 16 inch lengths, with variations in each size. For the longer cars to negotiate 42 inch curves, a short car must be placed between them. These car bodies are finely detailed, with ladders, catwalks, brake wheels, tiny door latches, and data on capacity and air brakes, the date the car was built, and the railroad name and number of a prototype of the car. Glenn had more than a hundred books about different railroads and their rolling stock and heralds for reference. The boxcars had one or two doors to a side. With double doors the long box car might be called a furniture or automobile car (like the Lionel #214). An unusual variation is the watermelon car, with a double door on each side. Half of it is a screen door to allow air to circulate around the melons in transit. It is based on a prototype from the Southern Railway. All the car data on the sides of the short Ferrocarril Chihuahua al Pacifico boxcar appear in Spanish. Along sidings in Mexico, a rail traveler may see such a boxcar used as a home for two families, with tin can flower pots around their cutout windows. Glenn also detailed some cars in French and English for Canadian railroads. Refrigerator cars also came in both lengths and six variations. Some bodies were all wood, some all metal, and one had wood sides with steel ends. They have realistic ice hatches and plug doors, but unlike Lionel and McCoy reefers, Glenn's plug doors do not open. For $25 extra, the long deluxe reefer came with outside braces on the car body. Glenn made only long livestock cars, no short ones. The frames, ends and doors of these cars are cast aluminum. Their sides are made of aluminum plate, with open slats and outside braces. They have catwalks, ladders, grab irons, and door latches like those on the box cars, which give Glenn cars much of the detail lacking in classic tinplate. Glenn custom built some rolling stock from the components of his regular line. Such specials include extra long A and B diesel units, wine tankers with four domes. a refrigerator car with four compartments with its hatches in the center of the roof instead of at the ends, a 70 foot mill gondola with drop ends, and a piggy back flat car built to carry six Lionel #205 Less than Car Load (LCL) boxes without tying them down. A Lionel #212 gondola carries only three LCL boxes. Sometimes Glenn and/or his friends would modify a regular item so much that it became a new design. For example, Bob Hendrich rebuilt seven of Glenn's 0-6-0 USRA switch engines as 2-6-2 Prairies. Wayne Henk welded the bodies of a Glenn F-1A and B unit together, and Glenn made a frame with four power trucks to go under it. This became a Union Pacific turbo diesel that was 29 inches long, and has a Union Pacific tank tender that is larger than the Lionel #400T Vanderbilt tender. Glenn produced only the bay window caboose in quantity, detailed for many different railroads. It has the ladders and lights required on prototypes by federal rules. There were two earlier cabooses made, both with cupolas. One is the caboose that wound up in Bob Hendrich's collection, which was designed by Red Forney and built with some Glenn castings. The other is an early Glenn caboose with a cupola and round portholes as windows. Glenn Gerhard built a bigger caboose after he sold the business. This one was 1½ foot scale, or half the size of an actual caboose (10½ feet wide and 48 feet long). It had a cupola, but no rails or wheels under it. This caboose was Glenn's retirement home located on Pinehill Road in Central Bridge, NY, which he built himself. It had neither plumbing nor electricity. He got his water from an uphill spring, he cut his own firewood, and used an outhouse. The lot had 45 acres, and he had planned to build a big outdoor railroad there before cancer made that dream impossible. Glenn said he was "still crazy about trains," although he no longer had any himself. What he did have from a lifetime of hard work were the fond memories of the years he spent making trains and the friends with whom he shared this hobby. Glenn Gerhard passed away at the age of 64 in 1995.